Go through crab meat and pick out any bits of shell or cartilage, leaving lumps intact as much as possible. Place picked crab in a large bowl. Add green onions, parsley, cilantro, jalapeno, Worcestershire sauce, lemon juice, Old Bay, and mustard to bowl. Carefully fold in without breaking up the lumps of crab meat. Beat egg in a second bowl; add mayonnaise and mix well. Gently fold into crab mixture and place in a strainer. Set strainer over a large bowl. Cover strainer and bowl with plastic wrap and refrigerate for several hours or overnight. Discard liquid and shape mixture into 6 cakes. They should be about 3 inches in diameter and about 1/2-inch thick. Cover and refrigerate until ready to cook. Place a baking sheet in oven and preheat to 200°F. Heat half the oil in a large skillet over medium heat until it shimmers in the pan. 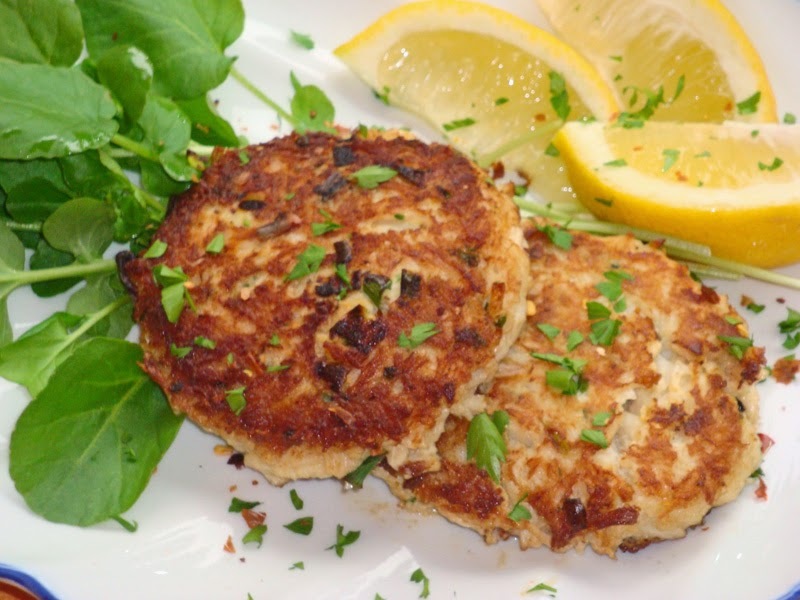 Place half the crab cakes in the skillet and cook without moving for 3 minutes or until the bottoms are well browned. Turn them over with a wide spatula. Cook for another 3 minutes until second side is brown. Transfer to heated baking sheet and put in oven to keep warm until the remaining cakes are cooked. Wipe out skillet and add the rest of the oil. Heat oil as before and repeat the cooking process. Serve warm. Many stores sell fresh crab in 1-pound cans that can be stored in the refrigerator for quite a long time. I’m not sure I want to know how they do that, but it is very good, with large, meaty chunks of crab, and it is also relatively inexpensive compared to the fresh crab at the fish counter. Be sure to get “real” mayonnaise. It will have real eggs and no sugar. Better yet, make your own fresh mayonnaise. (Dr. Mary Dan Eades’s wonderful recipe is in Nourished.) The nutrition data shown is for purchased real mayonnaise, such as Hellman’s, Best Food’s, or Duke’s. Some of the fat used for frying will be left in the pan. The amount left in the crab cakes is estimated in the nutrition data. “Light” olive oil has the same number of calories as other olive oil but it is more refined, giving it a higher smoke point than extra-virgin and making it a better choice for frying and high-temperature cooking. Extra virgin olive oil is best reserved for salad dressings and quick sautéing. Other oils that can take the heat without being damaged include natural lard, beef and poultry fat, bacon fat, and some nut oils. Thanks for the comment and the kind words! I appreciate them. Why real mayo and not fat free? Anonymous: natural fat, like eggs and olive oil, are not the enemy. Fat doesn't make you fat and natural fat doesn't cause heart disease. It keeps you full longer so you spontaneously eat less. Another problem with low-fat products is that they always have more carbs and sugar, which make you hungry so you eat more. Excess sugar and starch do much more damage to the body and wreak your metabolism. Another issue is that most store-bought mayonnaise is made with nasty, processed, pro-inflammatory oils like soy or canola. I recommend that you read Nina Techolz's book "The Big Fat Surprise" or Gary Tuabes's "Why We Get Fat and What to Do About It." can salmon be a substitute? Connie: Sure, that would be tasty!